The first set of stamps in this region were issued under the Kingdom of Hijaz under the rule of the Turkish Empire in the Middle East. The stamps appeared in 1916 and had a set of three values: the quarter piastre, the half piastre and 1 piastre. These stamps depicted carved door panels of the al-Salih Tala’i mosque in Cairo, a central design taken from a page of the Quran in the mosque of Sultan Barquq in Cairo and a detailed depiction of a prayer in the al-Amri mosque in Qus. These stamps were included in the 1917 series along with many other designs. Under a series of multiple rulers in the Kingdom of Hejaz and Nejd, many stamps with religious connotations and rulers and their family members during their reigns were issued. Until the 1930’s, up to 300 stamps with major varieties were issued under the Kingdom of Hijaz and Nejd. 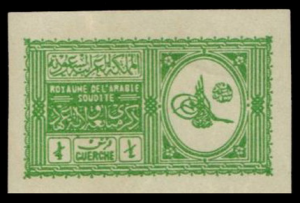 The first series of stamps marked the Kingdom of Saudi Arabia, specifically, was issued on January 1st, 1934. The Saudi Arabia stamp depicted King Abd al-Aziz’s tugra and were meant to celebrate the heir, Prince Saud. From 1934 to 1957, the 14 value Saudi Arabia stamps set continued to celebrate the King’s sons. 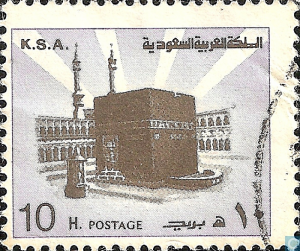 Other stamps in the series include an image of the Saudi Arabia arms, the religious site of the Kaaba, as well as other images representing the Kingdom’s modernization. 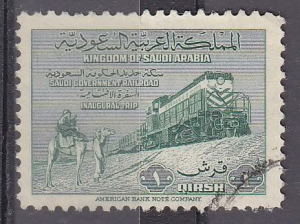 Saudi Arabia stamps have been printed mostly in Arabic, the national language of the region.